It has recently been observed that CABB zooms occasionally suffer what appears to be a corrupt first correlator cycle. This post will illustrate the problem, describe how to figure out whether your data may have been affected, and how to use Miriad to flag out affected data. In this plot the channel number is increasing along the x-axis, while the time is increasing along the y-axis. The plot also makes clear that for two scans the problem doesn't appear, and in the last scan the problem has a different magnitude to the earlier scans. Our correlator engineers are investigating this issue, and as yet a fix is not available. It has been found that this bug has existed since zooms were implemented, but obviously it requires a strong source and fast slews to be readily visible. Anyone who has used CABB zooms may be affected however. The corruption is isolated to the first cycle of any particular scan, and the correlator engineers have told us that it looks like 50% of first cycles are affected. Your first cycle of a scan contains on-source visibilities. If it takes more than 30 seconds to slew to your source, then this potentially corrupt first cycle will automatically flagged as off-source and you won't be affected. 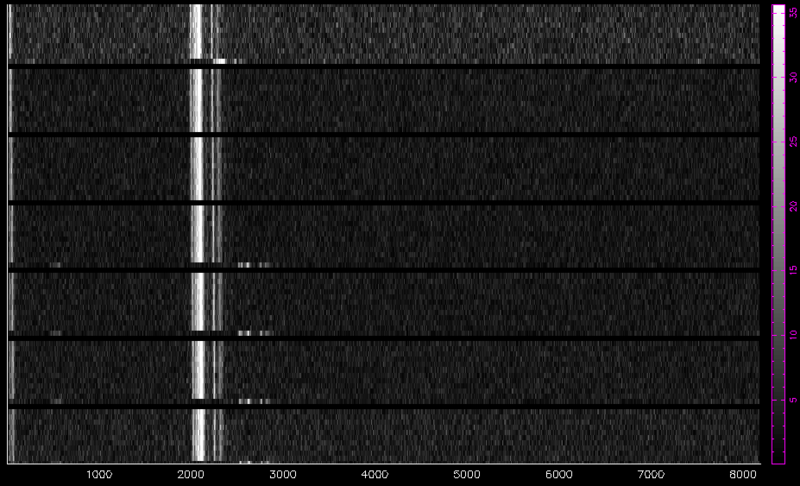 Of course, most observers will do "track" commands at some point during their calibration, and the telescope will be on source within 30 seconds in those circumstances, so it is likely your calibration data may suffer from this effect. Name Calcode Channels Channels Config No. As you can see, the first cycle on 1921-293 present in the data file starts at 22:10:00 (these are 10 second cycles), while the first cycle labelled as 1934-638 is at 22:22:40. We could easily flag out both of these first cycles, but do we need to? There is no way to tell in this case. Now you can see that 1921-293 would be affected by this problem: we now know the first cycle on 1921-293 is also the first correlator cycle in the scan. since the time is the same as before at 22:10:00. But the first correlator cycle for the 1934-638 scan was at 22:20:20, which is 2 minutes and 20 seconds before the first cycle while actually tracking the source (ie. the telescope slewed for 2:40 seconds between 1921-293 and 1934-638; the correlator starts cycling after the equivalent of 2 cycles time after the start of a scan). Therefore we don't need to flag out any further data for this 1934-638 scan. So how do we do the flagging? After using the "unflag" option in atlod, the Miriad task "qvack" can be used to flag the first cycle of every scan. This tells qvack to always flag the first cycle of every scan. If the first cycle is already flagged, most likely because the telescope wasn't yet tracking, then you won't lose any further data. You are now assured however that your data will not longer contain corrupt first cycles from CABB. From this point your reduction should be as per usual. More information will be provided when we know if this issue can be fixed. Please feel free to reply to this post if you have questions. Thanks to some quick work from our correlator engineers, this problem is now fixed. Only 1 MHz zooms were affected, since their implementation until 2014-April-23. All 1 MHz zoom data after this date will be unaffected by this problem. Hi Jamie, I see that you are not using "bary" in the atlod command. May I ask why? It's up to the individual investigator whether they want to use the default LSR frame, or the barycentric frame. I didn't include 'bary' as an option in atlod as it isn't crucial to the fix I describe. You can include 'bary' if you want with no problems.